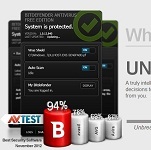 Bitdefender released their new generation of free antivirus | aeBeta : IT Resources and Reviews , Software Tips and Promotions ! Bitdefender has long been misunderstood as the #1 Antivirus product owing to some tricks on some kind of review website, although it truly have a great performance on PC market. Recently, again some website and blog report that Bitdefender release Free Stuff for the first time. In fact, we can learn that Bitdefender had free version before, which is free from a real time protection function like free Dr. Web. This time, the new generation of free antivirus is born with a real time shield now, meaning it can totally complete with other freebies such as Avira Free and Avast Free etc. You may gracefully found that this free antivirus supports the newest Windows 8!